Hanwha Chemical is a leading Korean petrochemical company. 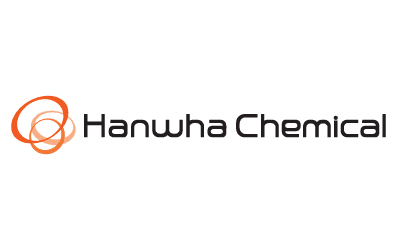 Founded in the mid 1960s, Hanwha has been especially prominent in the development of high-quality inorganic chemical products and general-purpose plastics. Hanwha was the first company to manufacture PVC in its country of origin and has built on this achievement by successfully producing a wide range of primary petrochemical products. A truly global company, Hanwha Chemical now operates in Thailand, China, Saudi Arabia, India and Malaysia as well as in Korea. The leading role that Hanwha has played within the petrochemical sector has firmly established its reputation as a forward-looking and ecologically responsible company that sees leading-edge technology primarily as a means of enhancing contemporary living. Accordingly, Hanwha places great emphasis on its customers’ changing needs and seeks above all to meet those needs by constantly adding value to its product range while also enhancing the structure of its manufacturing and commercial operations. Hanwha’s highly effective blend of creative and commercial drive has made it a respected leader within the petrochemical sector. By seeking out solutions that will reduce greenhouse gas emissions and by developing ecologically responsible products, Hanwha Chemical is taking a lead in fostering a clean and sustainable environment for the generations of the future. This mission is closely linked to the company’s general commitment to an ethical and transparent approach to management. The origins of Hanwha Chemical can be traced back to 1965, when the Hwasung Plant was established in Korea. The company’s innovative approach to product development led to a period of consistent growth and refinement during the 1970s. In 1974, for example, Hanwha acquired Korea Pacific Chemical’s interest in Hanyang Chemical and founded Hanyang Chemical holdings, Ltd. The 1980s witnessed even more dramatic growth, as the company expanded into Thailand and took on the Korean operations of the American multinational Dow Chemical. Further innovation and growth during the 1990s prepared the way for major developments in the period since 2000, a period characterized by the construction of key facilities, by the entry of Hanwha into the Polysilicon business, and by several major mergers and acquisitions. With its consistent emphases on product development and innovative market strategy, Hanwha Chemical stands ready to shape an even more prosperous future. A vital driver of future growth and prosperity is Hanwha’s commitment to research and development. The company’s R&D Center works tirelessly to develop new products that add value while also respecting the ecological health of our planet. These efforts are not limited to the existing chemical sector, since Hanwha is also researching future-oriented solutions in such fields as solar energy, biopharmaceuticals, and nanotechnology. The effectiveness of Hanwha’s R&D Center is further enhanced by its pursuit of joint development programs with relevant enterprises and important research organizations in different parts of the world. Hanwha’s R&D Center also looks to the future by providing the researchers of the future with learning opportunities, including scholarships and access to overseas MBA programs.